The workshop will be held at the Ross School of Business, 701 Tappan Street, Ann Arbor, Michigan. Visitors can enter the school from the main entrance on Tappan Street on the west side of the building. Signs will be posted at the main entrance directing workshop participants to the registration table and conference room. Book your hotel soon to get the best possible rate! Detroit Metro Airport (DTW) is located about 25 miles (40 km) east of Ann Arbor on Interstate-94. Take I-94 West to the State Street Exit, #177. Turn right (north) onto State Street, then travel about two miles to the intersection of State and Hill streets. Turn right onto Hill Street and proceed to Tappan Street. Turn left. The Ross School’s main entrance is located at 701 Tappan Street. Take U.S. 23 South to M-14 to the Downtown Ann Arbor/University of Michigan - Main Street Exit. Continue on Main Street south 1 ½ miles to Packard Street. Turn left on Packard, left on Hill Street and proceed to Tappan Street. Turn left. The Ross School’s main entrance is located at 701 Tappan Street. From I-94, take the State Street Exit, #177. Turn right (north) when traveling from Detroit, or left (north) when traveling from Chicago. Travel about two miles to the intersection of State and Hill streets, then turn right onto Hill Street. Proceed to Tappan Street and turn left. The Ross School’s main entrance is located at 701 Tappan Street. Online reservations and schedule information. Service has specific drop-off location. An additional cab will be required to get to your specific hotel. 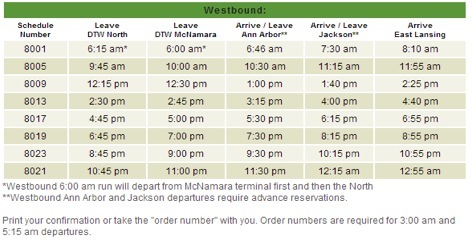 The cost is $15 from airport to Ann Arbor with advanced reservation and $20 if paid in cash on day of arrival. For those whose scheduled arrival or departure does not align with Michigan Flyer’s schedule, another option is to reserve a van pickup for multiple conference attendees. This can be done through nearly all area taxi services and should reduce the cost of rides between the airport and Ann Arbor. Reserve your spot soon for the best rates! Rates and rooms are subject to availability, so don't delay. We have booked two hotels for the workshop. Please reserve your room soon, and tell them you are with the Decision Neuroscience Summer Workshop as we have blocks of rooms reserved. Click here to make your online reservations at a special discount of $89 a night but only for reservations guaranteed by Sunday, July 26th! Book now to get this great rate!! IMPORTANT: If 2 people are sharing a room they can only make 1 reservation. When making a reservation they will enter "2 adults" and there will be a place where they can put both names. Check here for current weather conditions in Ann Arbor. Visitors are drawn to Ann Arbor for its eclectic urban setting and acres of parks and trees. This unique contrast offers something for everyone. The cosmopolitan college town boasts fine to casual dining and world-class shopping in nationally known stores and boutiques with local flair. Action-packed sporting events come courtesy of the University of Michigan  as well as 147 city parks, seven golf courses and endless trails. Cultural experiences, including museums, galleries and performing arts centers, make Ann Arbor a destination for arts aficionados of any age. Whatever it is you’re looking for  family recreation, the perfect gift, breathtaking scenery or even just unabashed fun  you’ll find it in Ann Arbor. Internationally renowned for research and education, the University of Michigan offers a wide variety of degree programs for undergraduate and graduate students. Students experience the "Michigan Difference" and our strong tradition of excellence in the classroom, on the playing field, and in the community. Outstanding and innovative academic offerings combine with a diverse campus community, the best faculty, and a central location in beautiful Ann Arbor to make it one of the nation's most desirable universities. The University of Michigan, a leader in undergraduate and graduate education and one of the world's premier research universities, has world-renowned faculty, rigorous academic programs and diverse cultural and social opportunities in a stimulating intellectual environment.